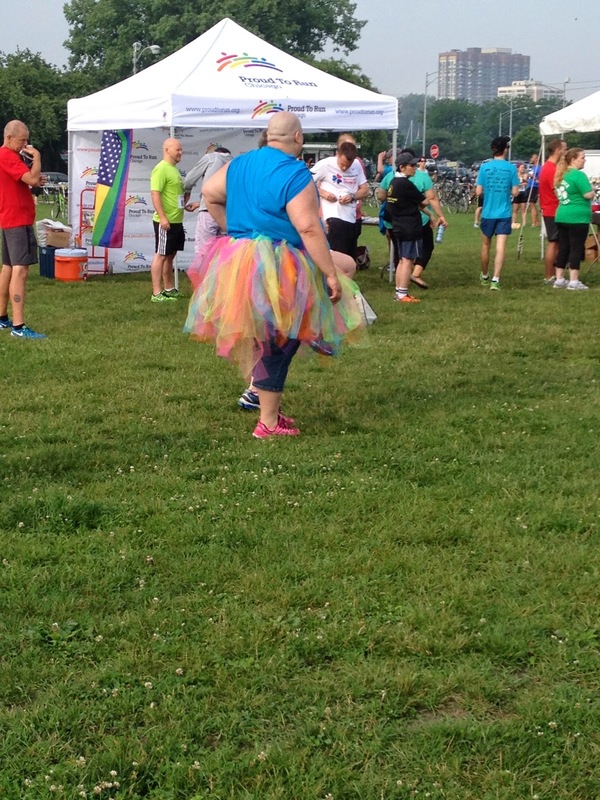 On Saturday, I ran the Proud to Run 5k. I was supposed to run the 10k, but, as I detailed in an earlier post, I was feeling ill and did the 5k instead. Although I was disappointed in myself for not following through with the 10k, the event itself was a lot of fun. According to their website, Proud to Run is "a 10K run and 5K run and walk that celebrates Lesbian, Gay, Bisexual, Transgender, Queer/Questioning, Intersex/Inquiring, & Allies (LGBTQI&A) pride. We welcome everyone who wishes to join us in the celebration to show support, regardless of sexual orientation, gender identity or expression." The event has been part of Chicago’s Gay and Lesbian Pride Week activities since 1982, and they have raised more than $350,000 for local LGBT organizations. This year's beneficiaries were About Face Theatre, TPAN, and The Night Ministry. The day of the race I woke up really early to get dressed and have a light breakfast before setting out. I made sure that I had everything I needed, including my bib number. I had gone to one of the early packet pick up days because I didn't want to have to deal with it the day of the race. I loved that early pick up was available over a period of several days, so it was fairly easy to get my packet in advance. My first race, last winter, only had a single day for early packet pick up, which made it difficult for me to get my packet before race day. Luckily, there was no problem like that here. Packet pick up was available throughout the week leading up to the race and was incredibly easy. The race started at Montrose Harbor, so it was easy to get there by bus. Once I got off the bus, it was just a short walk to the event site and starting line. I basically just followed the other people who were dressed to run and/or wearing the event t-shirt. Getting to the event site was kind of like playing follow the leader. I made a quick pit stop to use the restroom and then quickly found the gear check tent. All of the various booths/tents were well labeled and easy to find. Although there were a lot of people present (there were approximately 1,300 participants this year), the event didn't feel too overwhelming. Although it has been going on for over 30 years, the race still feels like a wonderful plucky little start up due to the low entrance fee, the lack of giant corporations, and the volunteer led nature of the event. There were a lot of participants, but not so many that it was crowded and uncomfortable. There was a group warm up led by some extremely excited and cheerful folks. Some folks chose to participate, others, such as myself, chose to watch, instead. It was very entertaining, and people seemed to be enjoying themselves. Everyone is having fun...except that one guy. Being an event during Price weekend, there were lots of rainbows - rainbow socks, rainbow headbands, rainbow shirts, even rainbow tutus. I was jealous of all the great outfits/accessories. When it was announced that the race would be starting soon, everyone made their way to the starting line. As usual, I positioned myself in the back of the line. It was hot and humid and sunny and I was already feeling ill. I was supposed to run the 10k, but when I came to the point in the course where the 10k and 5k split and went if different directions, I made a last minute decision and turned to finish the 5k. You can read about my awful run here. Although I was disappointed in myself, I wasn't disappointed with the actual event. The course was great and clearly marked, the volunteers were awesome and some of the best I've encountered at races, and everyone involved just seemed incredibly happy and supportive. I had several strangers slow down to ask if I was okay, and one lady even slowed down to walk with me for a bit and encouraged me to keep going. After the race, once I had a chance to cool off and get my bearings, I made my rounds of the various booths. There was the usual free food - fruit and bagels, granola bars and Gatorade, bottles of water, etc. I was still feeling sick, so I pretty much stuck to water, but I did take a little of everything to enjoy later. Each of the event's beneficiaries also had a booth where you could find out more about them. My favorite booth was About Face Theatre. There was also plenty of post race entertainment. A band, a dance group, a raffle...there were all sorts of things to keep the runners and volunteers entertained and happy. These guys were awesome and incredibly sassy! Everyone who finished got a finishers medal, and there were prizes awarded to the top three overall male and female finishers for both the 5k and the 10k. The top three in each age group were also announced and recognized. Our emcees for the day - Fox E. Kim and Jonathen Wikholm. Everyone seemed to have a good time, and I would definitely run the Proud to Run 5k or 10k again in the future. I'm hoping to be back next year to run the full 10k course.